The Santa Fe was Hyundai’s first sport utility vehicle to be incorporated into its lineup. Introduced in 2001 to the North American market, the Hyundai Santa Fe offered a five-passenger capacity vehicle with multiple engine and drivetrain options. The unusually powerful midsize crossover impressed both adventure-seekers and everyday commuters, alike. Today’s version of Hyundai’s Santa Fe is continuing that legacy, with seating for seven passengers and a host of other great features that make its third generation one of its best. The 2015 Hyundai Santa Fe did not receive any major styling transformations, but it did receive important mechanical updates to it’s steering column, for increased handling. 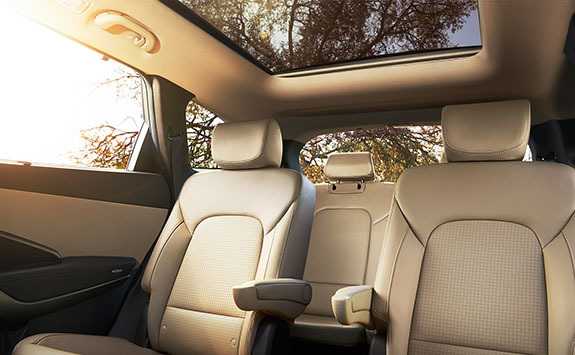 The 2015 Santa Fe offers drivers more standard features than the outgoing model, along with a brand new list of amenities. With more room, more power, and more appeal than other vehicles in its segment, it is no wonder that the 2015 Hyundai Santa Fe is one of the best selling midsize crossovers in America. When designing the 2015 Hyundai Santa Fe, engineers went to work to create a better overall driving experience. The result was an updated steering and suspension system on both the Santa Fe and Santa Fe Sport. The new systems generate better handling, a more refined steering experience, and a Driver Selectable Steering Mode for customized steering in changing road conditions. Hyundai engineers paired the new steering system with a brand new suspension. The revised front wheel bushings and suspension enhancements help to increase wheel bearing stiffness, overall lateral stiffness, and lower control arm bushing stiffness, for a smoother, more controlled driving experience. Aside from the steering system and suspension, the 2015 Hyundai Santa Fe has also received various updates throughout its exterior and interior. A long list of standard features is not only an important consideration when buying a new car, but they can also help to make everyday driving situations more comfortable, practical, and even more fun. Check out what is new on the Santa Fe for 2015. Drivers will also be happy with three new color options when choosing their Santa Fe, which include: Sparkling Silver, and Premium Graphite. One of the most notable additions to the 2015 Hyundai Santa Fe is its brand new power Hands-Free Smart Liftgate with Auto Open. Drivers will gain easy access to the rear cargo area, with this innovative industry-leading technology. The system works by allowing access to the trunk space when a person stands behind the vehicle for more than three seconds, with the Proximity Key in their pocket. Other automakers have tried to create such a technology, but drivers are left frantically kicking their feet to activate a sensor, all while trying to balance with their arms full. Hyundai remedied that scenario, making the Hands-Free Smart Liftgate with Auto Open is as easy to operate, as it is functional. The 2015 Hyundai Santa Fe has a base starting MSRP of only $30,150, and includes all of the above features. The 2015 Hyundai Santa Fe was built with high performance standards, durability, reliability, and plenty of space. The 2015 Hyundai Santa Fe stands up to the toughest competition in price, amenities, and warranty. Check out how the base Santa Fe GLS stacks up to the 2015 Ford Edge, and the 2015 Chevrolet Equinox. Price: The Santa Fe starts out at $30,150, while the Ford Edge comes in higher at $31,500, and the Chevrolet Equinox will cost drivers less at $28,170. Despite it’s lower price, the Equinox falls short in the amount of standard features. For less than $2,000 more, the Hyundai Santa Fe offers a longer list of standard features than the Equinox. Ford Edge: Basic warranty of 36 months or 36,000 miles, a powertrain warranty of 60 months or 60,000 miles, and a corrosion perforation warranty of 60 months. Chevrolet Equinox: A basic warranty of 36 months or 36,000 miles, a powertrain warranty of 60 months or 100,000 miles, and a corrosion perforation warranty of 72 months. The 2015 Hyundai Santa Fe clearly stands apart from the competition in many important aspects including initial cost and warranty.